Shown above (from left) are: Rhyner, Grosser, Boyce, Ritchie and Murphy. BOHEMIA, NY For the second year in a row P.W. 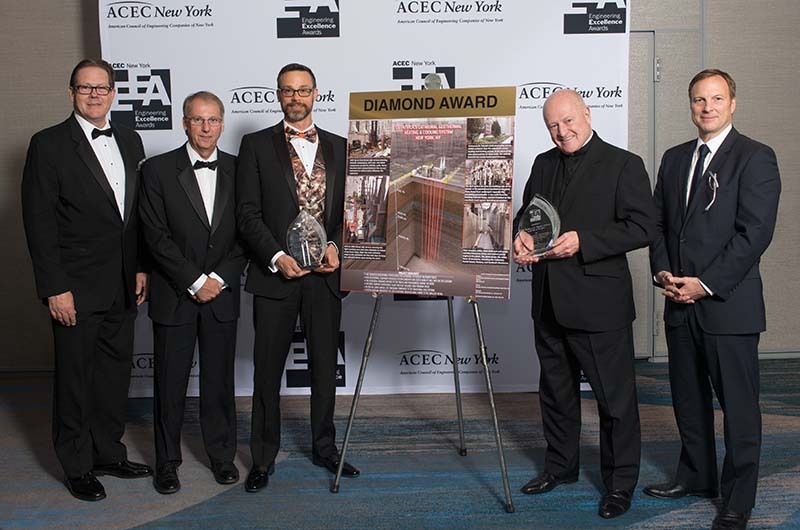 Grosser Consulting (PWGC) received an American Council of Engineering Companies of New York’s (ACEC-NY) Diamond Award – the organization’s highest honor – for the design of a geothermal heating and cooling system at NYC’s St. Patrick’s Cathedral. The project was done on behalf of The Trustees of St. Patrick’s Cathedral in the city of New York and Murphy Burnham & Buttrick Architects. 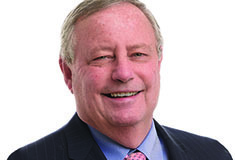 ACECNY’s recognition occurred at the engineering advocacy organization’s “Engineering Excellence Awards,” a black-tie affair held on April 7th at the Hilton New York Midtown. The annual event, which drew more than 800 attendees, celebrates the accomplishments of the state’s engineering companies through recognition of projects deemed to have the most impact based on a variety of parameters including complexity, timeframe and positive community influence. 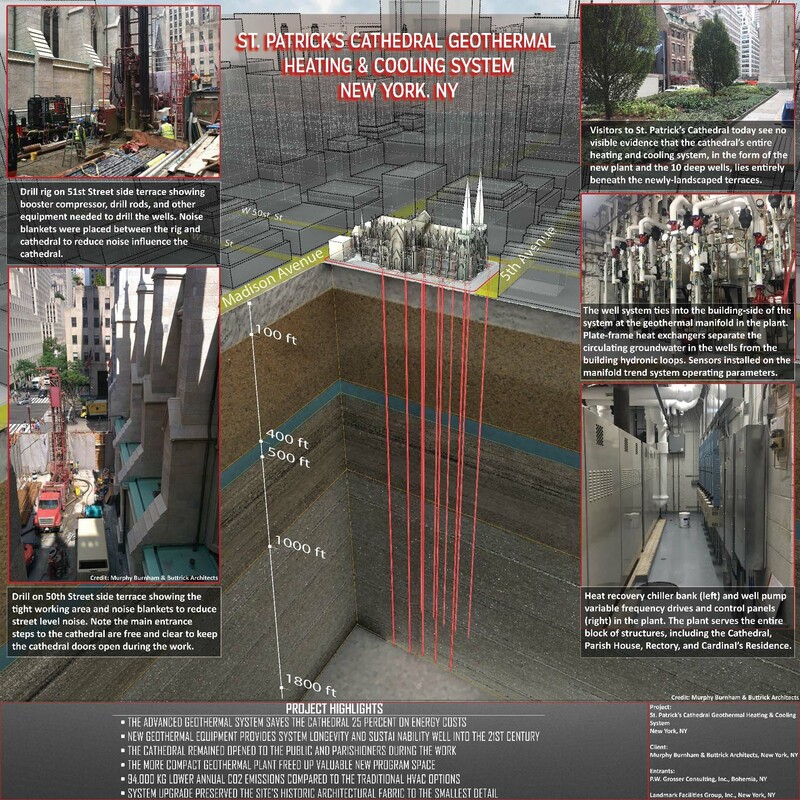 Among the challenges presented by the St. Patrick’s project involved constrained work areas that required extremely efficient use of space and coordination of the various trades working on the geothermal system, which was done in concert with the facade restoration work. Further, the project design featured drilling wells to a depth of 2,000 ft., a task that had never been attempted in the city. PWGC attendees included CEO Paul Grosser, PhD., PE, PG, president Paul Boyce, PE, and VP, geothermal services John Rhyner. Jeffrey Murphy from Murphy Burnham & Buttrick Architects and Reverend Monsignor Robert Ritchie from The Trustees of St. Patrick’s Cathderal joined PWGC in attendance. The Diamond Awards were presented at Hilton’s Grand Ballroom, which illustrated the St. Patrick’s Cathedral project in detail.